As part of the 35th annual Dr. Martin Luther King, Jr. Celebration, the OMA was honored to collaborate with Diversity & Cultural Engagement, University Housing and Dining Services, and the School of History, Philosophy, & Religion, to organize the event “Speaking Justice” – a night of spoken word poetry by the OSU community and our feature artist, TOO BLACK, on Wednesday, January 18, 2017. 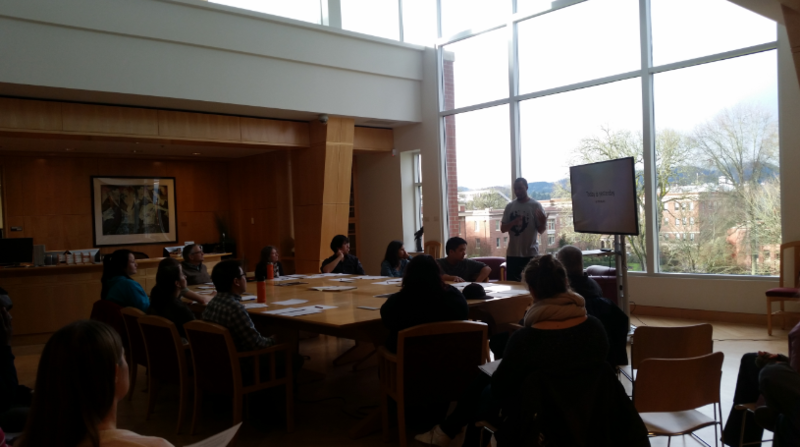 And, in addition to the performance, the OMA was delighted to host the workshop “History of Race Relations at OSU” facilitated by TOO BLACK. TOO BLACK, a graduate of Ball State University, is a spoken word poet based in Indianapolis, Indiana. The name TOO BLACK developed from wanting to challenge the perceptions of blackness and humanity in general. Influenced by a wide variety of artists and historical figures from Malcolm X to George Carlin to Audre Lorde, TOO BLACK brings a versatile perspective to the stage. TOO BLACK has a working dialogue that draws from personal experiences, historical and current events, and utilizes Hip Hop as a way to relay his point. He has a conversational performance style in which he is talks to the audience not at them. 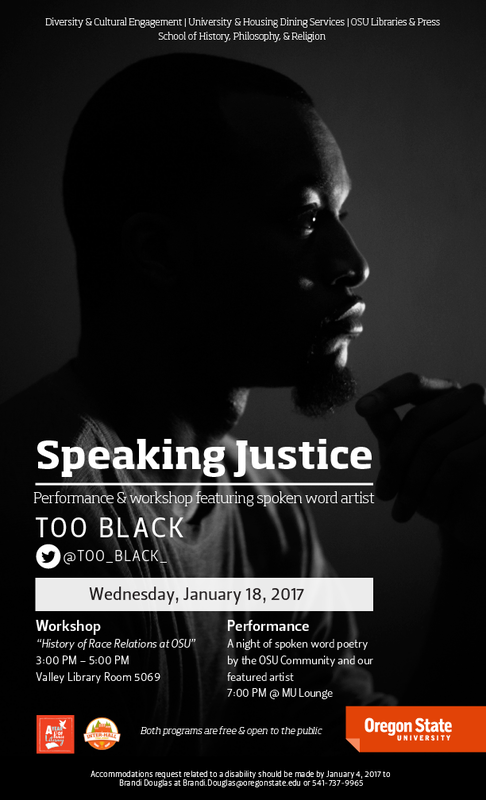 TOO BLACK teaches a poetry workshop called named “Speech is My Hammer” to empower children and young adults to think critically about issues of social justice. He is also apart of an Indianapolis based group called Axiom Collective. It is a community of dedicated artists and educators committed to transforming communities through creative expression, civic participation and transformative art education. TOO BLACK has been performing poetry professionally for four years. He successfully launched his own college tour called Education Redefined 101: Tips, Fees, and Degrees. ER 101 has provided an opportunity for TOO BLACK to perform at a wide variety of colleges and universities including UCLA, Boston College, and Penn State University among many more. Overall, TOO BLACK has featured and headlined venues throughout the country in 16 states including the historical Nuyorican Poets Cafe in New York City, Jus Words in Philadelphia, Soul Speaks in Chicago, and Busboys & Poets in D.C. In 2015 he was featured in AfroPunk online magazine. He has been fortunate enough to open for black panther legends such as Elaine Brown and Erika Huggins as well as starring in a tribute show to honor the late Gil Scott-Heron. 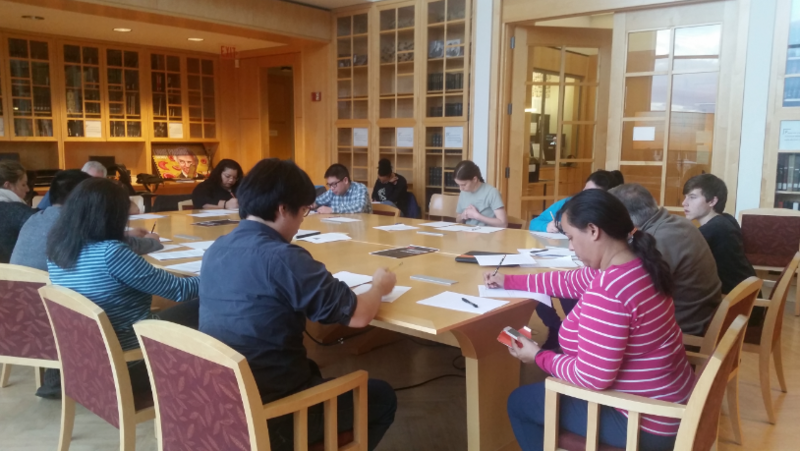 In the workshop, facilitated by TOO BLACK, participants learned about the history of race relations at OSU and its connections to contemporary issues. In his presentation “Today is yesterday” TOO BLACK shared his experiences from a recent visit to South Africa and connected it to an early 1980s protest and educational campaign led by the OSU African Students’ Association in response to wrestling coach Dale Thomas’ association with the South African wrestling community; the history is documented in the Ed Ferguson Oregon Anti-Apartheid Scrapbook. Through his facilitation, workshop participants connected the anti-apartheid student activism that occurred on campus to a number of contemporary issues: race relations at OSU today, our national context, what is currently occurring politically in South Africa, and the complex relationship between sports and politics. 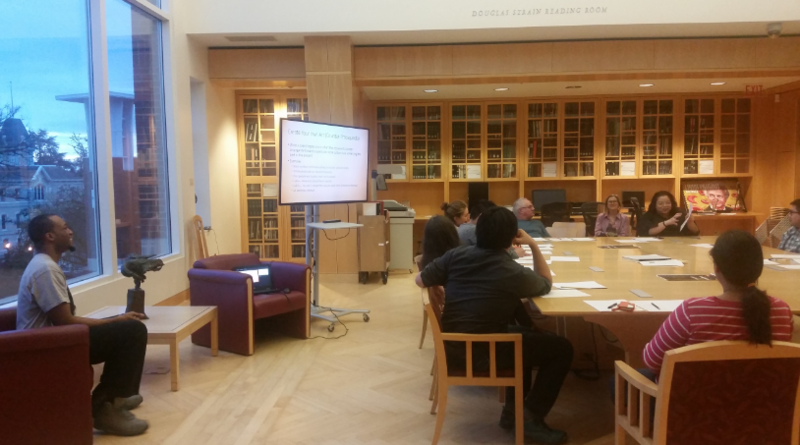 As part of the workshop, participants created their own spoken word poetry – and one participant even performed as part of the evening’s event! TOO BLACK explained propaganda and counter-propaganda, and how spoken-word poetry can be a form of counter-propaganda. 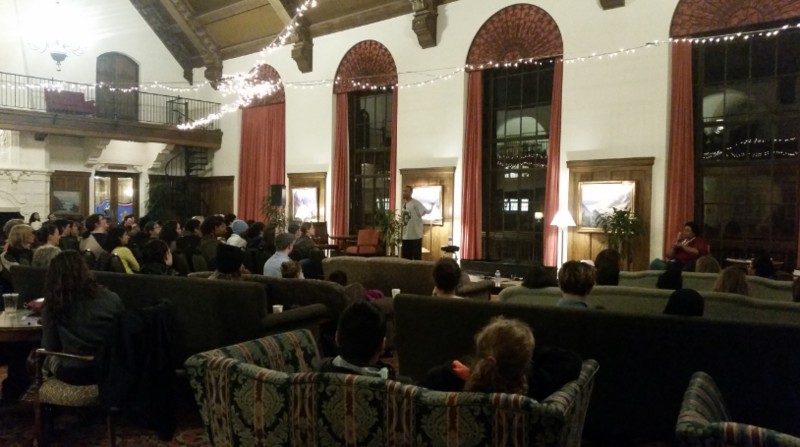 The performance took place in the Memorial Union Lounge and there were over 100 students, Faculty/Staff, and community members in attendance. The evening began with Brandi Douglas, of UHDS and one of the event organizers, welcoming all in attendance and with introductions to the students who shared their spoken word poetry. The students expressed their personal social justice struggles beautifully, and the first part of the evening closed with Douglas’ own poem which included audience participation. TOO BLACK’s performance included about a half dozen poems ranging in topics from apartheid and imperialism, student debt, police killings of black men, capitalism, and more. His presence was memorizing and his words were incredibly moving. Afterwards, he not only had an opportunity for a Q & A, he stayed late to share his book of poems – students lined up to purchase their very own signed copy.